Natural active ingredients for temporary relief of pink eye symptoms. When your little one gets pink eye, give them gentle relief with Kids Irritated Eye Relief. Similasan eye drops stimulate your body's natural ability to temporarily relieve symptoms without potentially irritating ingredients. Many other eye drops have vasoconstrictors that may actually worsen the symptoms of bloodshot eyes if used more than directed. With Similasan you can feel good about helping your family feel better without the use of harsh chemicals. A: The recommended dose is 2-3 drops per eye as needed. 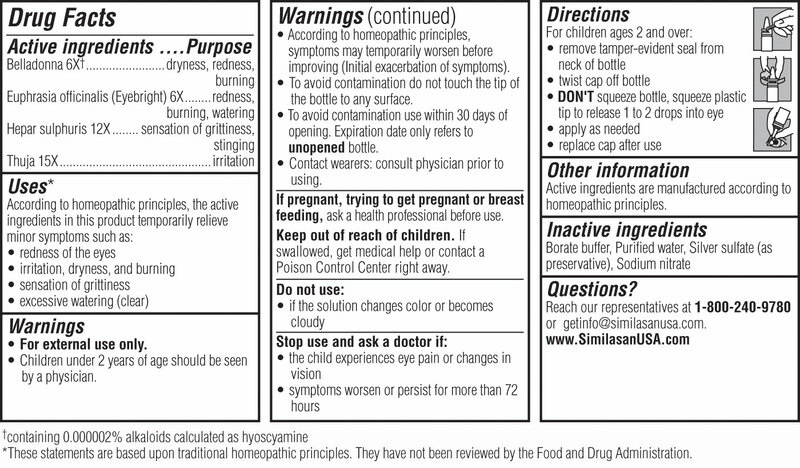 Continue use until symptoms diminish. Similasan eye drops can then be used as often as needed. A: Similasan has formally tested its eye drops for compatibility with contacts. Because of the natural active ingredients there is nothing in the product that will damage the lens. The drops will not harm your contact lenses, however if you have pink eye symptoms, it is best to avoid lenses for a while until symptoms subside.